Outdoor and indoor cycling is healthy for you and the planet. Cycling can maximize health, reduces emissions and delivers an intense full-body workout that keeps you young. Celebrities like Patrick Dempsey and Madonna epitomize cycling enthusiasm, from cycling through London streets to completing pro tours, such as the Giro D’Italia. Following is a list of the many ways cycling maximizes your health. Cycling relieves chronic physical and mental pain, enhances your circulation, and keeps your joints flexible. Healthy circulation and flexibility are direct antidotes to stiffness, swelling, fatigue and pain. Specialty bikes that are ergonomically designed and custom-fitted to your body make riding more comfortable, even if you struggle with chronic pain. Cycling gets you ripped. Muscles respond to weight-bearing exercise, getting stronger and leaner the more you push them. Toned muscle enables you to cycle with more power and stability, to navigate off-terrain and negotiate hills with ease. It also increases your stamina so that you can cycle longer without fatigue. The power phase of pedaling (the downstroke) recruits your glutes, quads and calves, essentially your entire leg from top to bottom. Meanwhile, the recovery phase (back-, up- and over-stroke) targets your hams and flexors, or the backs of your legs. Exercise is a general cure-all for a variety of mood disorders, including moderate depression. 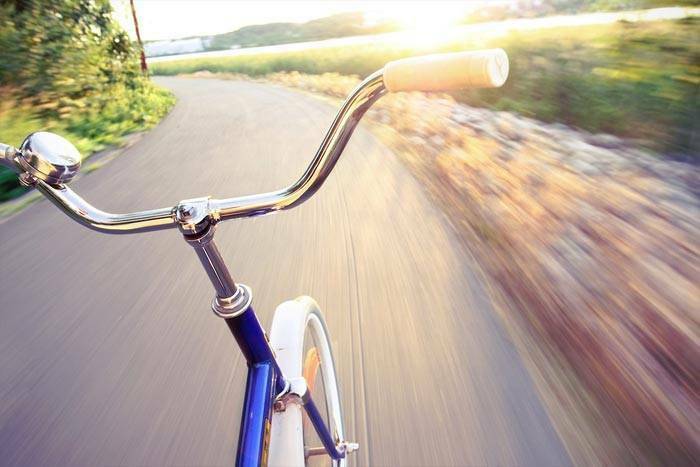 Cyclists tend to have a well-being score 32 percent higher than people who don’t cycle. Cycling causes your body to release adrenaline and endorphins, your body’s energizing, feel-good hormones. These hormones positively affect many physiological functions, ultimately boosting your sense of contentment. Endorphins dull your body’s receptivity to pain. Cycling outdoors also exposes you to fresh air, sunlight and diverse scenery, which is an added treat. However, cycling indoors is equally beneficial. You can just pick an exercise bike stand and transform your mountain bike into a rad stationary bike for rainy day-indoor rides. The benefits are the same, minus the diverse scenery and sunlight. Pedaling also builds your bones. Like a muscle, bones respond to load-bearing activities. Force exerted by tendons and muscles on your bones compels them to build new bone material. The jury’s still out on whether cycling prevents osteoporosis, with sections of the medical establishment saying either yes or no. Both sides present compelling arguments. In the end, since cycling can only be good for you, better to rely on it, diet and other healthy lifestyle choices to ensure long-term bone health. Pudgy cyclists exist, but they’re rare. Most cyclists who commit themselves to their cycling practice slim down in no time at all. Nothing cycles through excess calories of fat quite like cycling. It is low-impact on your joints and tendons, yet delivers the kind of fat-burning, muscle-building results associated with heavy lifting or high-impact, vigorous-activity sports, such as soccer. A University of East Anglia study found that an hour of daily cycling can automatically trim you down by 15 pounds in 12 months. According to Scandinavian research, cycling reduces your risk of obesity, developing hypertension, cardiovascular disease or diabetes. Additionally, cycling lowers your low-density lipoprotein (LDL), aka bad cholesterol. Next articleShould You Give Reiki a Try?